Determined to change her fate, Scottish Princess Merida defies an age-old custom sacred and unleashes chaos in the kingdom. $66.323 million on 4164 screens. With 2011’s Cars 2, Pixar’s golden streak came to an end. The movie got mediocre reviews and became its weakest-grossing film to that point – adjusted for inflation, at least. Did the studio bounce back via 2012’s Brave? Pretty much, as it earned stronger reviews and performed better at the box office. Still, I’d hesitate to state that Brave represented a real return to form from Pixar. While it has its charms, it doesn’t earn a place among the studio’s better efforts. Young Princess Merida (voiced by Kelly Macdonald) longs to take charge of her own life and emulate her warrior father Lord Fergus (Billy Connolly). However, her mother Lady Elinor (Emma Thompson) forces her to follow the path of a prim, proper princess, and that means that Merida will be forced to marry the winner of an archery contest. Needless to say, this upsets Merida, so she comes up with a sneaky solution: she’ll enter the contest and win her own hand. We follow the results of this effort as well as some magical twists that force Merida and Elinor to bond in an unusual manner. I’ll say this about Brave: its advertising campaign kept those post-archery plot machinations hidden. Going into the movie, I figured that the elements connected to the contest would fill most of the flick and that the competition itself would wind up somewhere in the third act. Nope – the story dispenses with that scenario pretty quickly, which allows it to then move on to more mother/daughter-related material. Which is a good thing, as those segments work the best. I must admit that I find the first act to be a bit tedious. Brave’s exploration of the stuffy, demanding mother and the wild, rebellious teen daughter feels stale and the movie can’t bring much new to the table. Through the archery contest, I think most of the story feels flat and not very engaging. Once that ends, though, matters pick up considerably. I find it tough to discuss the remaining two-thirds of the movie because I want to avoid spoilers - hey, if I went into Brave unaware of the story choices, you deserve the same chance! Without revealing too much, let’s just say that magic impacts the tale and changes the mother/daughter dynamic in an intriguing manner. Granted, it still goes down a well-trodden path, as the altered circumstances force Merida and Elinor to finally understand each others’ points of view, but at least the twists give the movie some kick. It gets more fun and creative once it moves past that archery contest. While the second and third acts certainly elevate Brave, I still regard it as “inferior Pixar”. Sure, it’s better than the disappointing Cars 2 and probably on a par with stuff like WALL-E and Ratatouille - two good flicks that just never rocked my world – but it never threatens to reach the heights of the best Pixar movies. There’s just an inherent lack of spark on display here, as Brave seems perfectly serviceable but it fails to present much inspiration or pizzazz. Everything here keeps us entertained but never prompts us to really embrace the story. A lot of that relates to the characters. While Brave allows for growth, I still don’t find much to differentiate Merida and Elinor from eight million similar mother/daughter personalities. They’re lackluster roles, and the same goes for almost everyone else – except for the Witch (Julie Walters) and her sidekick Crow (Steve Purcell). They don’t get a lot of screentime, but they enliven the proceedings when they appear. Otherwise, a two-word phrase starting with “ho” and ending with “hum” accounts for my general attitude toward Brave. It’s always professional and reasonably entertaining but it lacks the kick and emotional payoff I expect from Pixar. Footnote: stick around through the completion of the end credits for a funny tag. Brave appears in an aspect ratio of approximately 2.39:1 on this Blu-Ray Disc. Across the board, the movie looked great. Sharpness looked immaculate. At all times, the flick seemed crisp and well-defined, with no notable instances of softness on display. Jaggies and shimmering remained absent, and I noticed no signs of edge haloes. Source flaws played no role here, as the film stayed clean and fresh. Colors became a strength, as Brave boasted a broad, dynamic palette and the hues always dazzled. The various tones were consistently lively and really sumptuous. The Dolby TrueHD 7.1 soundtrack of Brave soared. It came with a wide variety of sequences that gave us chances for vivid material, and it brought those out in a satisfying way. The movie used action and magical scenes to allow elements to zoom around the room, and other set pieces threw many different elements at the viewer. Audio quality was solid. Music appeared vivid and rich, with good highs and warm lows. Speech was consistently distinctive and natural, while effects showed great range. <:> Those elements appeared accurate and dynamic, as they packed a strong punch. Everything worked nicely here to form a strong soundtrack; it’s one of the best I’ve heard in a while. Expect a slew of extras across this five-disc set. Along with the 2D rendition of the film on Disc One, we also get an audio commentary from director Mark Andrews, co-director Steve Purcell, story supervisor Brian Larsen and editor Nick Smith. All four sit together to discuss story/character areas, music, editing and deleted/altered scenes, cast and performances, visual design, animation, and a few other topics. I think Pixar commentaries tend to be better than those for most other animated films because they usually focus on non-technical issues. While I like to learn about some of the animation specifics, that material can become more than a little dry. No such problems greet this lively track. Story and characters become the main focus and we find out a lot about the movie’s evolution. We get good notes on changes and we learn why the filmmakers made the narrative/character choices they selected. This is a consistently informative and engaging piece. Two Short Films appear here. La Luna (6:57) accompanied theatrical screenings of Brave and shows a young boy who accompanies his father and grandfather to work: they sweep fallen stars off the Moon. When I saw “La Luna” with Brave, I thought it was precious and cutesy, and that opinion hasn’t changed. It’s not a short that does much for me. A new short, The Legend of Mor’du (6:51) shows us some backstory that features in Brave. Narrated by the movie’s witch character, we get the details about how a young prince turned into an evil bear. We learn a bit of this in the film itself, but “Legend” fleshes out the specifics – and comes with an unexpected comic ending. Under Behind the Scenes, we find eight featurettes. These include “Brave Old World” (12:35), “Merida and Elinor” (8:24), “Bears” (6:10), “Brawl in the Hall” (5:29), “Wonder Moss” (2:45), “Magic” (7:06), “Clan Pixar” (4:46) and “Once Upon a Scene” (7:47). Across these, we hear from Andrews, Purcell, Larsen, director Brenda Chapman, producer Katherine Sarafian, art director – shading Tia Kratter, story artist Louis Gonzales, production designer Steve Pilcher, art director – sets Noah Klocek, sets supervisor Derek Williams, screenwriter Irene Mecchi, simulation shot lead Henry Garcia, supervising technical director Bill Wise, simulation supervisor Claudia Chung Sanii, supervising animation director Steve May, director of photography - lighting Danielle Feinberg, character development and animation John Chun Chiu Lee and Dovi Anderson, cloth artist Fran Kalal, art director – characters Matt Nolte, character modeling and articulation artists Tanja Krampfert and Lou Hamou-Lhadj, groom artist Laura Hainke, character supervisor Bill Sheffler, supervising animators Alan Barillaro and Steven Hunter, crowds lead Paul Kanyuk, sets forest development Inigo Quilez, director of photography – camera Robert Anderson, development and effects artist Chris Chapman, associate producer Mary Alice Drumm, directing animator Kureha Yokoo, and actors Emma Thompson, Robbie Coltrane, and Kelly Macdonald. The shows cover research, realism and Scottish influences, set/production design, cast and performances, story and characters, action scenes, various animation issues, and altered/abandoned sequences. When added together, the “Behind the Scenes” pieces create a good look at the film. All of them offer information of merit, though “Scene” is the most interesting as it delves into “the Brave that could’ve been”. I wish this area included a “Play All” option, but that’s a nit-pick, as the quality of the material makes the components worthwhile. We also find four Extended Scenes: “Meet the Lords” (3:20), “Triplets’ Distraction” (3:20), “The Ruins” (4:20), and “Blockade” (1:34). Mark Andrews introduces all of these and gives us a few details about them. Most animated “deleted scenes” are actual sequences cut before they were “shot”. These, however, mostly offer final animation, which comes as a pleasant surprise. As for the additions, they tend to be pretty minor – indeed, they’re minor enough that the Blu-ray shows a “scissors” icon when deleted material appears so we’ll know what changed. I like that helpful addition and even though the extensions aren’t remarkable, they’re fun to see. Disc One opens with ads for Monsters University, Planes and Peter Pan. These also show up under Sneak Peeks along with clips for Sofia the First, the Brave videogame, and Finding Nemo. No trailer for Brave shows up here. Disc Two devotes an entire Blu-ray to bonus materials, though don’t expect hours and hours of information; indeed, leaving out an “Art Gallery”, the disc’s total running time runs only about half an hour. I’m not sure why everything wasn’t placed on one Blu-ray, as I suspect it would’ve fit without trouble. Fergus and Mor’Du: An Alternate Opening goes for two minutes, 40 seconds, and come with another intro from Andrews. He gives us the usual helpful facts before we see the sequence in question. Rendered with rough animation, it shows a quick flash of battle. I’m not sure it would’ve added to the film, but it’s good to check out the piece. A few more featurettes appear: Fallen Warriors (2:08), Dirty Hairy People (3:33), It Is English… Sort Of (3:50), Angus (3:25) and The Tapestry (3:56). “Warriors” gives us some brief movie snippets that didn’t make the final release; they’re too short to merit separate “deleted scene” consideration, but they’re mostly final animation, so they’re cool to examine. The other pieces offer more traditional “making of” clips with comments from Pilcher, Purcelll, Kratter, Nolte, Sanii, Garcia, Andrews, Chapman, Barillaro, Yokoo, Macdonald, Hainke, Wise, Larsen, May, Drumm, technical artist and lifelong medievalist Patrick Guenette, sets supervisor Derek Williams, character supervisor Colin Thompson, “genuine Scotsman” Patrick Doyle, story artist Emma Coats, first assistant editor Sarah Reimers, animator Jessica Torres, simulation technical lead Alexander Nehls, character shading and paint artist Philip Child, and actor Craig Ferguson. These featurettes cover a few areas of the production and are similar to the “Behind the Scenes” snippets on Disc One. That means they’re just as fun/interesting. I’m still not sure why this footage didn’t just end up on Disc One, but I enjoy it anyway. Under Promotional Pieces, we get a mix of elements. “Feast Your Eyes” (3:40) delivers “wee bits of animation”, little cartoon snippets created specifically for the reel; not unlike a fake blooper reel, it’s cute but insubstantial. “Relics” (1:09) shows presentations from the clans; it feels like a deleted scene, and its amusing. “Clan Dun Broch” (1:10), “Launch” (0:29) and Flying Guts Theater” (0:59) work the same and are also enjoyable. We also find US, UK and Japanese trailers for Brave. An Art Gallery covers five areas. We get into “Characters” (178), “Color Keys” (95), “Development Art” (96), “Environments” (65) and “Graphics” (37). These offer a surplus of interesting images, and the interface makes them easy to access. 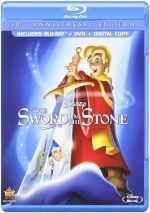 Disc Three provides a DVD Copy of the film – with a smattering of extras such as the audio commentary – and Disc Four gives us a Digital Copy of Brave. 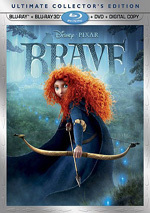 Disc Five delivers a 3D Blu-ray Copy of Brave along with a 3D presentation ofLa Luna. The picture comments earlier reflect the 2D edition – how did the 3D compare? Picture quality seemed largely similar. As usual, brightness took a bit of a hit, so low-light shots became a little darker. I also thought a couple of wide shots appeared a smidgen softer, but most of the film exhibited solid accuracy. As for the stereo image, it opened up matters in a pleasing manner, as the 3D offered good depth and immersion. We got some fun “pop out” elements via the wisps as well as arrows and swords. Though never a dazzling presentation, the 3D added to the material and created an enjoyable way to watch the movie. The 3D disc opens with 3D trailers for Finding Nemo, Monsters University and Planes. While it does manage to provide decent entertainment, Brave doesn’t compare to Pixar’s stronger offerings. It just feels like something’s missing, as it seems enjoyable but not particularly engaging. The Blu-ray delivers excellent visuals and audio along with a nice set of supplements. I feel pleased with this release and wish I could muster more enthusiasm about the film itself, though I do think the 3D rendition adds spark to the movie.